In 1836, French physician Charles Poyen Saint Sauveur toured the Northeast United States, giving public demonstrations of mesmerism. The demonstrations ignited widespread interest in mesmerism, especially among physicians and—perhaps oddly—clergymen, many of whom began their own experiments in mesmerism and, eventually, in other methods of inducing trance and other unusual states of consciousness. Included among these methods were drugs, massage, and electromagnetic stimulation of the brain. Among the physicians or scientists who experimented with mesmerism were James Stanley Grimes, Phineas Quimby, and (at Harvard) John Webster. A cadre of clerical experimenters undertook their own public lecture and demonstration tours during the 1840s. 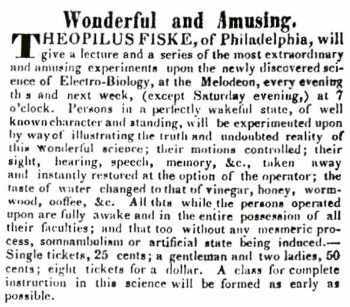 The demonstrations consisted of lectures and the induction of trance in members of the audience, much the same as modern day stage exhibitions of hypnotism. Methodist minister LaRoy Sunderland was one early practitioner, who gave the name of “Pathetism” to his version of mesmerism. Many Universalist ministers also undertook their own experiments. The name “Electro-Biology” was popular among them to describe their exhibitions. Among the Universalist clergymen who delved into mesmerism, became proficient “operators,” and gave lectures on the subject were Sylvanus Cobb, Charles Chauncey Burr, Theophilus Fiske, and John Bovee Dods. Every one of these clerical mesmerists subsequently became spiritualists, at least for a while. All of them struggled with the fact that the apprehension of spirits and other paranormal phenomena, such as clairvoyance, could seemingly be induced by physical, non-spiritual means, and that often the mesmeric operator (and others present) could see that the experiences of the entranced subject were illusory. In 1841, mesmerist and physician Joseph Rodes Buchanan discovered a precise site on the head of his mesmeric subjects that, if stimulated with electromagnetic energy, would induce the subjects’ apprehension of spirits. He called the site, on the temporal lobe, the “organ of spirituality” and mapped it alongside other phrenologically-inspired sites on the skull. Many people, however, rejected the notion that humans’ mental faculties and spiritual characteristics could be located in particular physical organs. They regarded that as too materialistic a theory. Did the fact that spiritual experiences could be induced by material means imply that all spiritualistic phenomena were false? Were the spirits just a bit of undigested beef, as Ebenezer Scrooge said at first of the ghost of Jacob Marley? Mesmerists were not all of the same opinion about the answer. Some, such as Grimes and Quimby (and, later, Burr) settled for a materialist explanation that discounted spirits. But many others, including Joseph Buchanan and every clerical mesmerist mentioned above, reconciled their physics and their metaphysics, allowing for spirits. They regarded the spiritual world as the “inwardness” of the material world. The spirit was fundamental and informed matter, making it what it was. God and spirit acted upon the world through matter itself, turning electromagnetic stimuli, drugs, massage, and other “mundane” things into sacraments, in some sense. Matter itself was the spirit’s instrument. The mesmerists’ struggle to answer these questions concerning the relationship of spirit and matter was intense. A good example is in the story of John Bovee Dods, who took up his experiments into mesmerism as a consequence of his spiritual experiences. He came to disbelieve in spirits as a result of his mesmeric investigations, but then turned back again into a devoted spiritualist. The entranced, mesmeric subject gave evidence of having made clairvoyant voyages to other times and places, and of contacting spiritual beings, including the spirits of the deceased. When spiritualism burst upon the scene, the “medium” who made contact with the spirits of the dead became the center of the “spirit circle” or séance. That person often had become a medium when he or she had been able to induce a trance state in themselves. 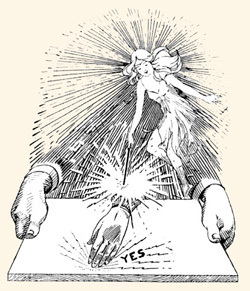 Techniques for “developing oneself” as a medium appeared soon after spiritualism began, probably because many people had already had almost a decade of experience with developing hypnotic states through the experiments of the mesmerists. One set of phenomena associated with trance is that of automatism or involuntary action. It took the form of automatic speech or writing, but other, more uncanny possibilities included such things as the sudden, spontaneous appearance on the skin of the medium of writing in the form of raised red lines, which would just as suddenly disappear. An early practitioner of automatic writing was Charles Hammond, the Universalist pastor at Rochester, New York, who became involved with the spirit manifestations around the young Fox Sisters, and soon became a medium himself. He published several books written by the spirits who, he said, moved his hand, into which he had placed a pen. At the beginning of one of these books, he published a set of simple procedures for those who wished to develop their “mediumistic” abilities. As many more people gained experience with séances, those who conducted them developed procedures and rules that would maximize the potential for psychological benefits and minimize the potential for harm. Automatism can occur without overt trance. From the mid-1850s, spiritualists used planchettes to receive spirit communications. A planchette was a small plank on rollers, set on a piece of paper on a table. Through the middle of the plank, a pencil was inserted so that it just touched the paper. A medium would gently place her or his fingers on the edge of the planchette and wait for it to be moved across the paper, tracing out words. A similar device, which first became popular in the 1880s and was commercialized in the 1890s, remains popular today as a kind of board game. 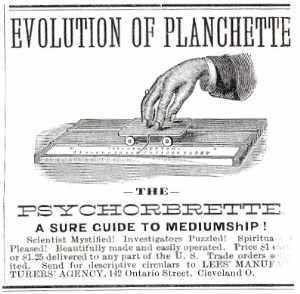 Yankee inventive ingenuity took hold of the planchette, just as it did other tools, instruments, and machines. Many variations of the device were marketed. Spiritualist lecturers undertook speaking tours around the country. Some of them addressed their audiences while in a state of trance, of varying depth. 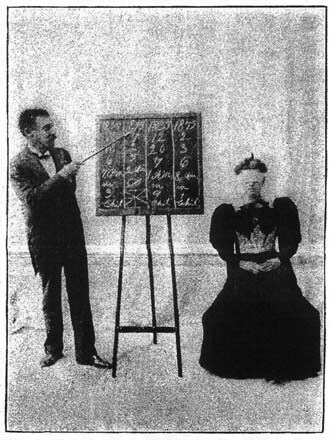 In common terminology, a spiritualist lecturer could be a “normal” speaker, which meant that she or he delivered a speech while in an ordinary state of consciousness. Or she or he could be an “inspirational” speaker, which referred to a light trance state, open to spirit inspiration while speaking. Or she or he could be a “trance” speaker, which indicated a deeper level of trance. In this state, the trance speaker, acting as a direct medium with the spirits, often would not be conscious after the speech of what was said or done by and through her (or him) while in front of the audience. The mental state of Miss [Achsa] S[prague] during these efforts affords some characteristics, not peculiar perhaps among mediums, but of interest in forming an opinion of their true source. According to her statement, she retains her consciousness complete, so as to be herself a listener to the words spoken through her lips, but her consciousness becomes partially merged into that of the controlling mind, by which she becomes elevated, as it were, and for the time feels herself to be a disembodied spirit addressing mortals. At the same time she is aware that she is not either originating the thoughts or furnishing the words for their expression—nor does she know beforehand the topics of discourse. While speaking she can not control her organs of speech, for they are moved by another will. Hence she is aware that sometimes ungrammatical sentences and words are employed, much to her mortification, but has no power to restrain or correct them. To repeat an argument we have often before stated: It is evident these discourses are the product of conscious mind, which is working with a purpose and to an end; the visible speaker is conscious that it is not her mind, and hence it must be another; it claims to be a distinct mind, a disembodied spirit, controlling the organism for the time being by permission of its rightful owner. Why must not this claim be admitted? The most famous trance lecturer was Cora L. V. Scott (who through subsequent marriages acquired the last names of Hatch, Tappan, Daniels, and Richmond). Writers of the time, already influenced by the Romantic movement, were intrigued by trance lecturing, and by the possibility of cultivating the ability to encounter what we might today call a different level of consciousness. Writing and speaking in the trance state produced material that was evidence of the medium’s liberation from the narrowing conventions of the world. Women, especially, found in it a way of emancipating themselves.